I have been reading and relishing your postings every day. I very much appreciate your postings — the images, the event of the day, the 'Memory of the Day', and the 'Photo of the Day'. You do a wonderful job. Thank you very, very much. You have both my blessings and support for this project. I wish you all the success. You have my blessings and support for any glorification of Prabhupad. I am honored to have my memories on your website. As far as I am aware, no one else is doing what you are doing. Thank you for giving us such a wonderful way to connect with Srila Prabhupada every day. Your app is fantastic. The work you are doing sounds invaluable as a reference material to the pastimes of Srila Prabhupada. Feeling our love for Gurudeva increasing just by hearing about your noble efforts to glorify His Divine Grace. Surely Narada Muni will rejoice over this broadcasting of the vina vibrations of a Siddha Saint's mahima. I think you are working at a noble mission, gathering all of Prabhupada's lilas, biographies, memoirs, etc. I am enlivened to hear of your service. 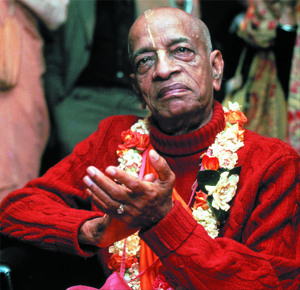 I am happy you are doing something so nice to dedicate to Srila Prabhupada. Thank you very much for the valuable seva you are rendering in glorification of Srila Prabhupada! I like very much your presentations. Thank you for your nice service. Simply the best of all the Prabhupada Lila webs. I relish your daily releases. The life of a pure devotee as a treat to our eyes. Be in the association of Srila Prabhupada. Always. - My only wish is to have my consciousness purified by the words emanating from his lotus mouth. Srila Prabhupada brings us the knowledge of the Vedic literatures with his hard hitting analogies. The glories of a pure devotee are inexhaustible. May your glories now be proclaimed throughout the three worlds. One of the qualities of a pure devotee is that he is a kavi. You can also be a part of this noble cause of glorifying a pure devotee thru this website and Srila Prabhupada Lila app. You can contribute with your valuable time and/or money.